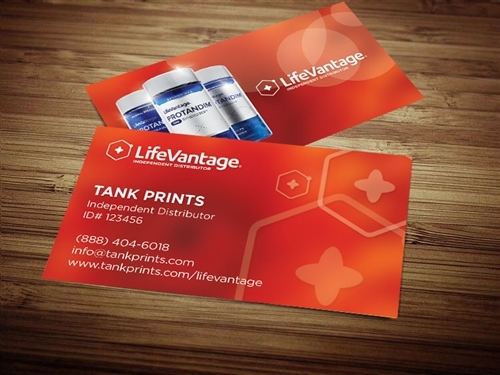 LifeVantage Business Cards - Prices start at $39.99 for 250 cards. Why buy from us? Our cards are printed on thick 16 point premium grade paper. They come to your doorstep within 5 business days or less! The sole purpose of a business card is to have a great first impression, not only that - but a good design makes a good LASTING impression. Don't settle for anything less than our cards! All designs are quality inspected before printing to make sure your information fits on the cards. Any questions please email us. Delivered to your doorstep withing 5 business days or less. If you're not satisfied with your cards, we will reprint them free of charge. Just ask us! The quality of the cards exceeded my expectations especially for the price. Definitely will be ordering more cards from TankPrints in the future & have already referred my friend & Family to the site too. Printed on very nice, thick card stock. Professional looking cards. Ordered my first set of business cards from Tank. So impressed! High Quality and delivered ahead of time.